Eastern Bluebirds in Tennessee do not migrate, but stay with us throughout the winter. They are joined by other bluebirds from neighboring states to form small winter flocks to aid survival. Finding food became more difficult two weeks ago, when freezing rain coated everything with 1/4 inch of ice and temperatures plunged to single digits for several days. Though incredibly beautiful, the ice and severe cold created harsh conditions that can use up a bird's fat reserves very rapidly. 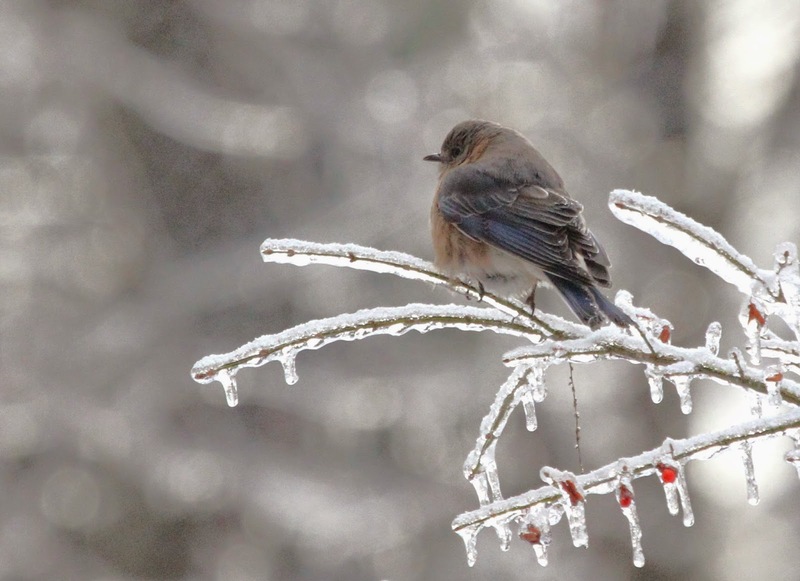 Seeing bluebirds plucking tiny ice-coated berries from the burning bush offered some reassurance that they were finding some nutrition. I instantly wanted to paint this scene, drawn by its delicate beauty and the story of survival it represents. 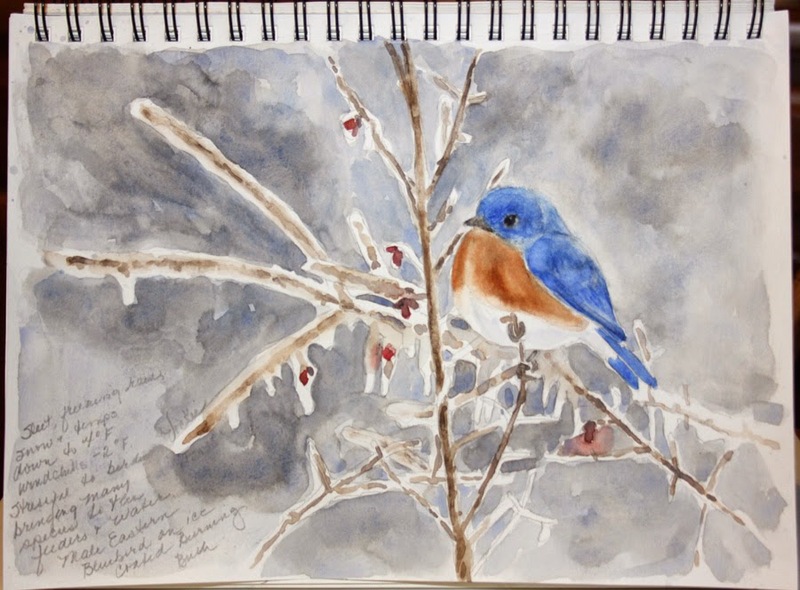 Winter Watercolor--Bluebirds on Ice at Vickie's Sketchbook. 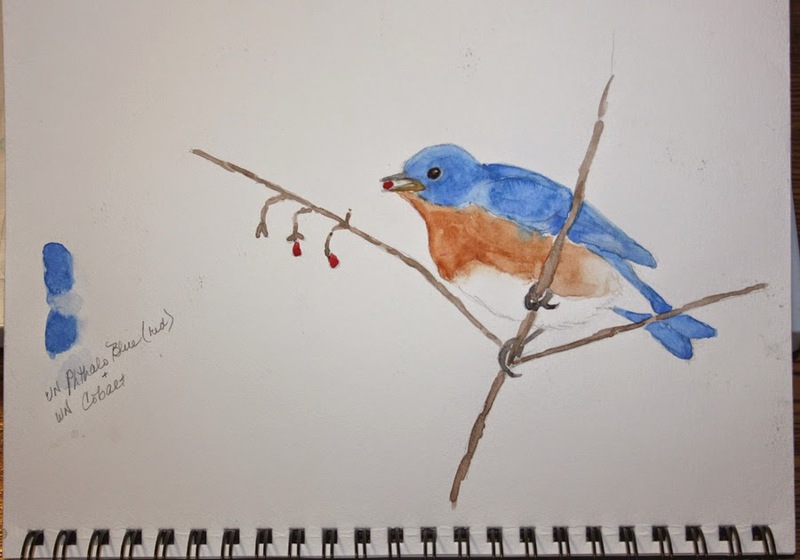 For more about feeding wintering bluebirds visit: Ice and Bluebirds--a Special Matter at Vickie Henderson Art. I especially like the icy painting on the top. I Hope that ice has thawed by now. Oh, this is wonderful...love the icy one too. Our bluebirds passed through briefly last week and I miss them already.